Hydrogen-powered vehicles have been in construction and development for the past 25 years. Currently many different types of transportation run on hydrogen fuel, including buses, trams, bicycles, motorcycles, tractors and airplanes. The potential for hydrogen-fueled vehicles seems very favorable to those concerned about environmental impact. Hydrogen-fueled vehicles do not have emissions other than the water that is created by burning the hydrogen fuel. Toyota first started experimenting with alternatively fueled vehicles since 1992 and built its first hybrid gas/electric fueled Prius in 1997. As of 2014 Toyota unveiled the first commercially sold hydrogen-fueled Toyota Mirai, with the Hyundai Tuscon coming out later that year. Toyota has become one of the front-runners in the emerging hydrogen fuel industry. Currently, there is little development as far as fueling stations for consumers. There are 14 fueling locations in the Los Angeles, California area. One of the first issues that were encountered upon introducing the new vehicles to consumers is figuring out that balancing act that is required by selling this many cars per station available. Being on the front lines of the implementation of hydrogen-fuel technology, Toyota is expected to lose thousands of dollars per vehicle till the industry takes off. 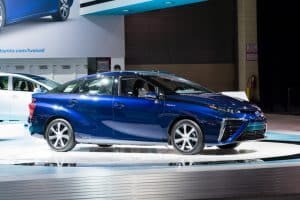 Toyota is pairing with hydrogen and fueling provider Air Liquide to build 12 hydrogen fueling stations in New York, New Jersey, Massachusetts, Connecticut and Rhode Island over the next two years. Toyota is aiming to sell 3000 units by the end of 2017. Fully electric cars can travel an average of 125 miles per charge, which can take 10-20 hours depending on the model. Hydrogen-fueled vehicles are estimated to be able to travel over 300 miles with a 3 minute refuel time. Some are still skeptical of alternatively fueled vehicles because the energy produced to run them burns fossil fuels as well. For instance burning coal to make electricity for an electric car.